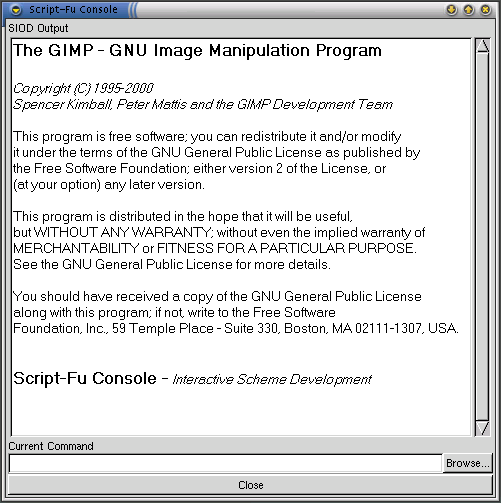 The following tutorial was written back in 2000 and newer versions of Gimp might not fully support the examples given here. The following tutorial is written for The Gimp 1.1.24. Some things described here will not work or will work differently with The Gimp 1.0.x. Ok, now we take the first step:what we want to do in Script-Fu, we try to do first in The Gimp as normal. That is important, 'cause we need to know exactly which operation we need, and in which order we need to call them. So let's create our test image, first of we create a new rgb image (File->New Image) and insert some text into it, say the word "Test". Then we duplicate the text and apply a metal gradient to the top layer. Then we take the second text layer and enlarge it a bit, to do so, we use the alpha-to-selection function and grow the selection by a few pixels. Then we fill the selection with the same gradient, but in a another orientation. At last, we merge the layers and apply a standard drop shadow. When that is done, we auto-crop the image, to remove all unnecessary parts of the image. The task is now to reproduce these steps in the Script-Fu Console: where you can enter Script-Fu Commands and test them. Use the Console to test all new functions you aren't handy with; in the Console you can more or less debug your written scripts. It's easiest if you test every line of Script-Fu first in the Console and then parallel-write the Script-Fu, once the commands act as you expect them to. To do so, we open the Script-Fu Console (Xtns->Script-fu->Consol). When the console is open, we click on the Browse... button in the bottom left corner; this brings us to the DB Browser, where you can search for functions which you can access from within Script-Fu. Along with the name of the function, you also get a description of the arguments it expects and a general description what the function does. The first line is simply the command that was executed, the second line is the return value of the function. As you can read in the DB Browser, this is the ID of the newly created image. You can simply use the ID as an argument to functions in the console. The return value is also the first pitfall on our journey to Script-Fu. It comes as a one element long list and not as a integer value! So to use the value, we have to get the first element of the list with car, it will then return the image with ID 3. You might notice that the constants RGB-IMAGE and NORMAL-MODE is listed as RGB_IMAGE and NORMAL_MODE in the DB Browser (notice the underscore '_'). You have to replace all the underscrores with minus's '-' in the Script-Fu world. If your are unsure if your replacements are right, just enter the constant into the console. The displayed image looks a bit wierd, cause it is filled with random colors, to erase them, we will fill the layer with the current background color. The function to fill a layer is called gimp-drawable-fill and not gimp-layer-fill as you might expect, that's because a layer is a drawable. So if you are searching for functions to manipulate layers, you should also look out for stuff that manipulates drawables. The last line in a scheme function is the return value, so image is the return value in this function. And voila, we have our text on a newly created layer. The string "-freefont-blippo-heavy-r-normal-*-24-*-*-*-p-*-iso8859-1" might look like black-magic to you, but we will see later an easy way to create it. Huh, now we have everything for our script-fu ready, we just need to attach the pieces. In the following steps we will also remove some unnecessary action and probably add some stuff. Ok, so how to write a Script-Fu? Well, you need basically three things. First, a file where your script is written down, that file should be placed in ~/.gimp-1.1/scripts/. Second, a function, which does all the image manipulation, and finally you need to have a call to script-fu-register to make your script visible from inside the Gimp. So lets write an empty function and register it. You should copy&paste the following code into a file dummy.scm and save it to ~/.gimp-1.1/scripts/ as described above. When you then press Xtns->Scritp-fu->Reload your script will be loaded into the Gimp and should be accessable from the menu. Notice, that there are two kinds of Script-Fu's. The first kind will create a new image, thats used for logo's and accessible through the menu Xtns->Scritp-fu->..., and the second kind will manipulate an existing image, this kind is accessible through the right-click pop-up menu on an image Scritp-fu->.... To register the second kind of Script-Fu, you need to adjust the path to <Image>/Script-Fu/... and it needs to take the first two arguments of type SF-IMAGE and SF-DRAWABLE. So back to business, lets finish our Script-Fu example. We should start with the frame work, so we need to decide which argument types we need. As we want to create a font, we first need the text, so we use SF-STRING, than we should use SF-FONT for the font selection and in addition SF-VALUE to enter the font size. "Create an example image of a custom gradient"
The following is a list of common pitfalls in Script-Fu. When a function returns a value, it will always be encapsulated in a list; it doesn't matter whether only one value or multiple values. Even if the return value is itself a list, like for example the color returned by gimp-color-picker, the return value will always be encapsulated in an extra list. If multiple values are returned they are also in a list, the first return value is the first element in the list, the second is the second list element, etc. So you need to always apply a car call to get the correct value. When you start to play with Script-Fu, and even when you are familiar with it, you will very often run into a situation where your script doesn't work. To make it even worse, sometimes you will not even get a error message. Most of the time, the cause will be simple, but the search hard. The following steps might make the search easier. First of check that your script is syntactically correct; that means you have closed all opened parentheses and quotes. An editor with syntax highlighting, automatic indention and parentheses highlighting will help to accomplish that. Second, you might have forgotten to add a car to some return value. To check for these errors, copy&paste your code into the Script-Fu Console and call it manually. The above is most likely the error message you will get, if you get another error message, your bug might be elsewhere. Than simply have a look at the errobj: it will tell you which arguments were expected and which you supplied. At last if your function will still not work, add some print calls at the right places to check that everything is working correctly. To see the output of the prints you have to run your Script-Fu in the console. For now I have described what you can do with Script-Fu, but there are also a lot of things which you can't do in Script-Fu. The first thing, that you might want to do is to provide some better default values for the argument that your function will recieve. The bad news is that you can't do that, you can only pass constant values to the Script-Fu register call. So if your default value should, for example, be half the width of the image, you simply can't do that, you have to live with an constant value. Another thing you might want to have is some sort of GUI which goes behind the stuff that is provided by the SF-* values; and again: you can't do this. 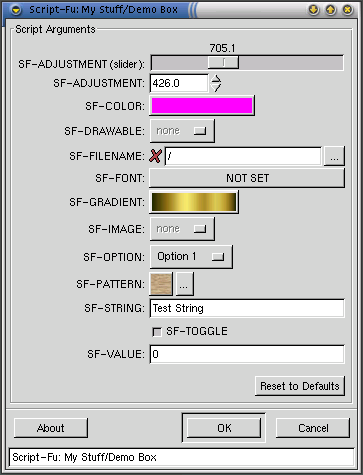 The SF-* values are all the gui that you can expect from Script-Fu. If you want more complicated stuff, like a preview window, you have to write a real Gimp Plug-in. At some point you might want to write your own filter or effect, which needs image manipulation at pixel level. That's a thing that you actually can do in Script-Fu. But it will be extremly slow, due to the interpreted nature of Script-Fu. So again, it's better to write that as a real Gimp Plug-in. You might also want to open a directory and open all the images in it. Not even that is possible. The SIOD webpage describes the opendir function, but when you try it in Script-Fu it will not work as many other SIOD function. To solve this you have to work-around this by dumping the directory contents to a file and read that file instead, or you can write a Perl-Fu, Python-Fu or a Gimp Plug-in. There exists a project called gimple in the Gnome CVS repositiory which might fix some of these issues. 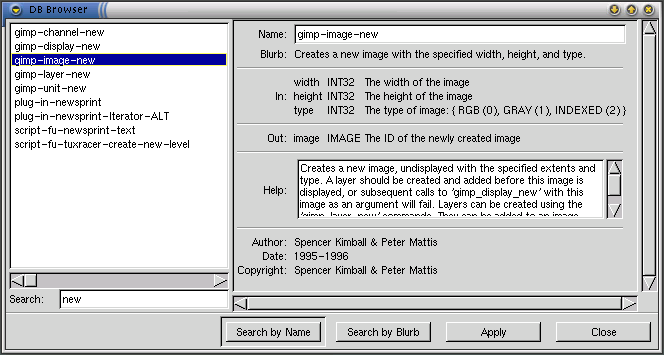 Gimple is a Guile interface for Gimp. It will have much better R5SR compliance than SIOD and will probably be able to call guile-gtk, to enable the creation of much more flexible gui-interfaces, but I don't know the status of this project and have never seen it in action. It is always a good idea to have a look at foreign Script-Fu's to learn. Script-Fu's can for example be found in the Gimp directory /usr/share/gimp/1.1/scripts/. There are also some links to other Script-Fu sites at the Gimp webpage. I have also uploaded my Script-Fu's, you can find them here, but be warned, most of them are not documented, and some might not work at all.